We are fair, honest and unbiased. We act with integrity and fearless independence. We believe that communication, accountability and value are paramount in building strong client relationships. We appreciate the whole person, respecting their individuality and diversity. We take a collaborative, flexible approach, working co-operatively to deliver the best outcome for all parties. We celebrate our successes and take joy in working together. We are knowledgeable, sensible and astute in our advice and authentic in our relationships. Our work contributes to societal change and we strongly believe in the value of what we do. These are the things we value…. And why our clients value us. Worklogic works with employers to prevent and minimise the impact of illegal and inappropriate conduct in the workplace and to build a positive culture. Impartial and robust investigations into workplace complaints and allegations of misconduct, conducted by our respected investigators. Independent, effective mediations to resolve workplace disputes and issues, conducted by our experienced, accredited workplace mediators. Insightful, actionable workplace reviews into problematic, dysfunctional or unethical teams and workplaces, and of critical incidents. Our independent, secure complaints reporting service for people to report misconduct and unethical behaviour at subscriber organisations. Engaging workplace training to support positive cultural change, build interpersonal, management and investigation skills and minimise risks. Create meaningful organisational values to inspire your people and underpin organisational decision-making and behaviours. Astute and practical advice to help leaders create positive, healthy workplaces and to provide sound support during times of change and conflict. Compliant, robust and effective HR and employment policies and codes of conduct that set the standard for acceptable workplace behaviour and minimise risk. Worklogic is thrilled to announce the launch of of our latest book Fix Your Team published by Wiley! 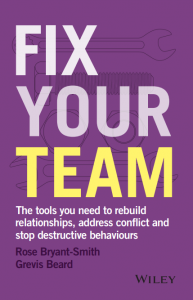 Fix Your Team gives you the tools you need to to rebuild relationships, address conflict and stop destructive behaviour. With Fix Your Team, you can get your team back on track! Praised as “Action-focused, energising and brave” by bestselling author Marshall Goldsmith, Fix Your Team is a must-read for every manager and team leader. Order hard copies in bulk and save! Sign up for weekly blog posts, news and event invites.